Remember the delightfully engaging 2013 Masterchef Finalist Saira Hamilton who won praise from John Torode and Gregg Wallace for her ability to “pack flavour” into every dish? Well here is a chance to watch Saira Hamilton cooking live in Malton’s Cookery School and get first-hand hints and tips on how to create delicious dishes from scratch with simple, easy-to-find ingredients. Tasters are included so come with an appetite! Saira will also be sharing with you her journey from childhood kitchen helper, to organised crime-fighter, to reality TV star, to full-time chef, food writer and cookery teacher. 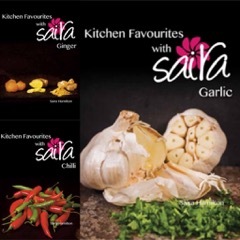 All dishes cooked during the demos are featured in Saira’s cookbooks ‘Kitchen Favourites with Saira: Chilli; Garlic and Ginger‘.